Alas, my Sweater of the Summer Olympics did not get done during my 17 days of avid sports-watching. 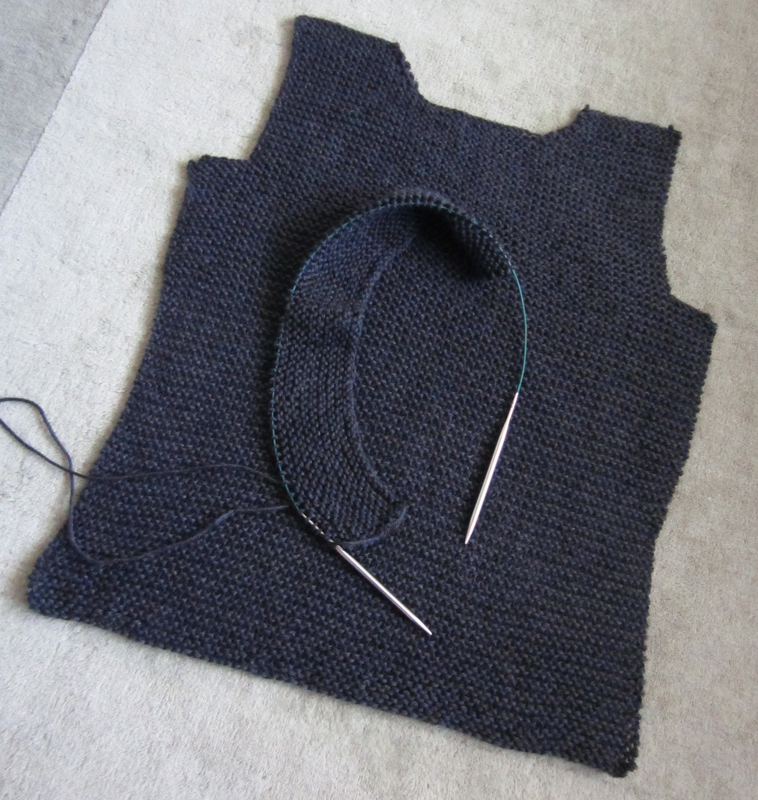 Its cowl neck is almost finished, but it still lacks sleeves. My husband semi-jokingly suggested that I turn it into a sweater vest. On an entirely different note—if you’re reading this, please drop me a line to let me know if it looks OK, format-wise. This is my first attempt at writing a post on the WordPress mobile app (because my only-two-year-old laptop is dying, ugh), and I am not entirely confident in the app’s abilities. I’ve finished the back of the sweater, and am getting started on the front. And, well, that’s all I have to say at the moment. Time to get back to the needles! We’ve entered that two-week period when the TV is always on in my house, a time more commonly known as the Olympic Games. We like watching the Olympics. My husband is a particular fan of track and field, and I enjoy learning more about sports and countries that get little attention otherwise. 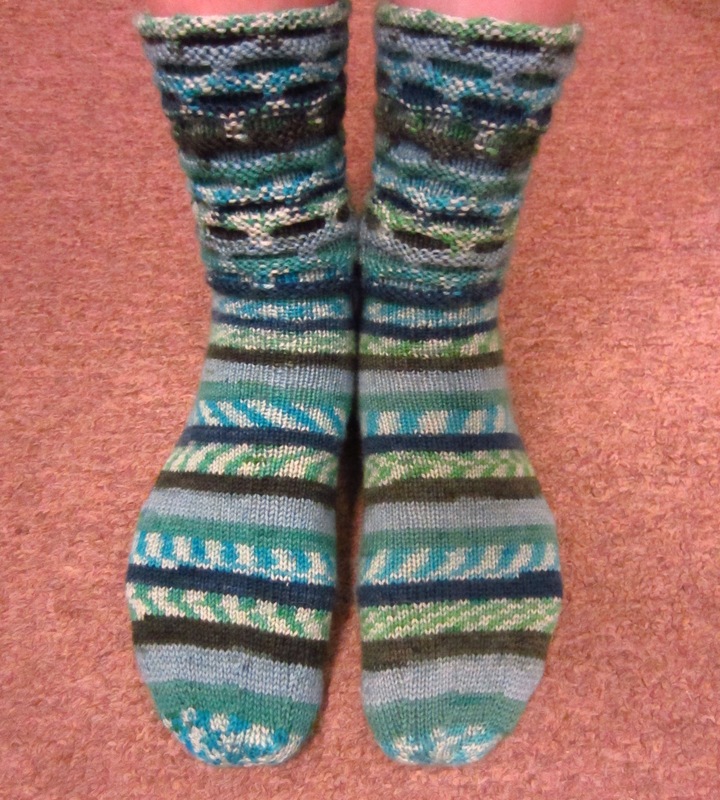 This year, now that I’m back into knitting, there’s extra fun to be had. Ravelry, the yarn and pattern database / project organizer / fiber-craft-oriented social network, hosts an event called the “Ravellenics.” The goal is to knit or crochet or spin something over the 16 days of the Olympics (presumably while watching the Games on TV, although that’s not strictly required). 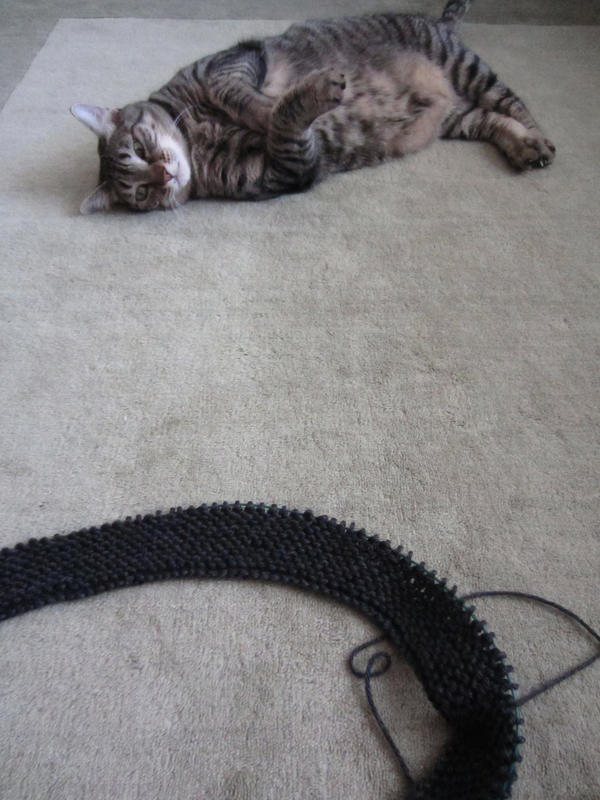 I am not a fast knitter, so making something start-to-finish over that time is already a challenge. But apparently I felt that wasn’t enough and decided to make a sweater. It’s called the “So Easy Sweater” and is 97% garter stitch, so I have hope. I cast on Friday night while watching the Opening Ceremony and trying not to cringe at NBC’s awkward and vaguely offensive commentary. My cat helped me take some pictures of my progress on Saturday. 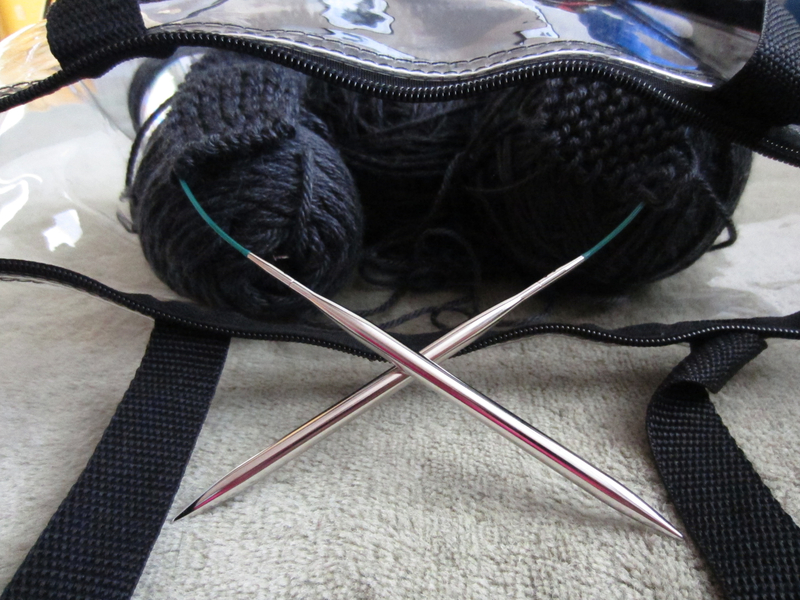 Knitting needles! Yarn! And about an inch of sweater. It’s quite soothing and pleasant to just curl up on the couch and watch sports and knit. And since my anxiety has been having odd spikes lately, soothing and pleasant is exactly what I need. Are you watching the Rio Olympics, readers? What’s your favorite Olympic sport? Now that I’ve gotten back into knitting and am feeling a bit more motivated to complete things, I’ve pulled some old projects out of hibernation and am working on the finishing touches. 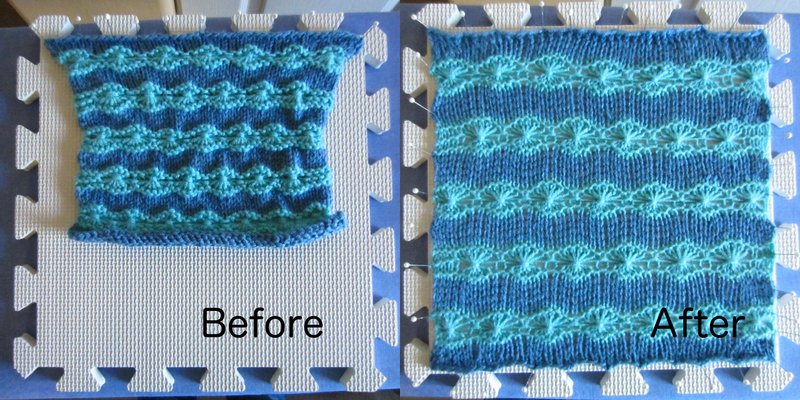 That means weaving in ends (soooo tedious), sewing pieces of an afghan together (even more tedious), and blocking. Blocking means coaxing your knit piece into its final shape and dimensions, using water or steam; it’s basically the process of making everything look nice at the end. The whole pinning and steaming procedure is a nicely meditative thing to do while Little Boy takes his afternoon nap. Not long after I posted my thoughts on raising a boy in a world of gender stereotypes, I received an unexpected email. Like everyone online, I receive quite a few unsolicited emails—typically spam-blasts offering fraudulent part-time jobs to students and equally fraudulent requests to attend fake conferences—but this one seemed more relevant than usual, so I took the time to read it. The email turned out to be from singer Craig Pomranz, who is also the author of the children’s book Made by Raffi. He’d seen my post and thought I might like his book. He was right: I like it a lot. So much so, in fact, that I want to tell you why. Made by Raffi is the story of a boy who feels a little bit different. He likes to hang out by himself at recess, preferring quiet solitude to rowdy games. During one of these recesses, a teacher shows him how to knit. Raffi’s classmates react to his enthusiasm for knitting in the way you might expect, until they realize that the ability to create beautiful costumes is actually pretty cool. There’s another message here, too, one that applies to kids of all genders, which is that it’s OK to sit on the sidelines and do your own thing. Raffi’s happy ending isn’t about running off to play soccer with the other kids. He continues to sit alone, knitting, now comfortable in his own interests and accepted by his peers. As an introvert, it took me until my late teens to begin to realize that being mostly uninterested in social events didn’t mean there was something fundamentally wrong with me. I still struggle with this feeling sometimes. Major credit is also due to illustrator Margaret Chamberlain, whose bright, lively artwork is filled with a diverse cast of children and adults. Knitting and sewing look like a lot of fun! (Which they are, I might add, speaking from experience.) When Raffi sews a cape, the text and illustrations provide enough detail on the process that I can just imagine a child jumping up from the book to make his or her own cape. I look forward to finding out what Little Boy thinks of Made by Raffi in a couple of years. In the meantime, I highly encourage other parents and gift-givers to check it out.